The so-called "gas war" between Russia and Ukraine reached a critical point in January, with the high-stakes showdown not only causing further damage to the financial health of both countries, but also harming the economies of 18 nations in the European Union. For nearly two weeks during the standoff the supply of Russian natural gas was completely cut off in Greece, Hungary, the Republic of Macedonia, Moldova, Montenegro, Serbia, Croatia, Bulgaria, Slovakia and Romania. Eight other E.U. countries experienced some degree of gas loss. With Russia and most of eastern Europe reeling from the global economic crisis, the incident came at a difficult time for all countries involved. Russia and Ukraine have both denied being responsible for the gas cut-offs, and similarly both countries claim to have emerged triumphant following the dispute. However, the confrontation is expected to have a lasting negative impact on both nations as the affected E.U. countries consider searching elsewhere for new and more reliable gas suppliers. Ukraine has been a transit venue for Russian gas for three decades, since the former Soviet Union built pipelines through Ukraine to supply European countries with gas from Siberia. Currently, 80 percent of Russia's exported gas is transited through Ukraine, and the rest of the gas is supplied to Europe through Belarus and a smaller pipeline in Turkey. Frosty relationships between Russia and Ukraine over the pipelines began 17 years ago, almost immediately after the collapse of the Soviet Union. Since becoming an independent state, Russia has not been satisfied by the fact that it supplies gas to Ukraine at a cheaper price than the rest of Europe. Russia has also repeatedly accused Ukraine of siphoning gas from export pipelines for its domestic needs. Meanwhile, Ukraine has demanded Russia pay higher fees to use its pipelines for transit to Europe. The disputes came to a head for the first time in 2005, when the Russian government-controlled gas supplier Gazprom and Ukrainian national gas company Naftohaz Ukrainy failed to reach an agreement on gas prices. On January 1, 2006, Russia cut off its gas supply to Ukraine. The flow was restored just three days later when an agreement was reached, but the relationship between the two countries remained tense. The most recent confrontation, heralded as the "gas war" by local media, resulted in a larger loss of gas supply and more serious consequences for the countries involved. The latest dispute began when Gazprom officials made statements on Russian television saying Ukraine had neither paid its gas debt owed to Russia, nor signed a gas supply contract for 2009. During December 2008 Ukrainian President Victor Yushchenko and Russian President Dmitry Medvedev traded barbs over the claims. Yushchenko denied reports Ukraine was in debt of close to $1.6 billion, indicating that the figure was much less, while President Medvedev warned that Russia would use its "entire arsenal of possibilities" if Ukraine did not pay its full debt. Unable to resolve the dispute, Russia cut off its gas supply to Ukraine on New Year's Day 2009, while continuing to supply the rest of Europe through the Ukranian pipelines. Gazprom CEO Aleksei Miller said the decision to stop supplying gas was made because Ukraine had rejected a price increase. Miller also accused Ukraine of stealing gas from the transit pipelines and requested that the European Commission organize an independent team to monitor gas transit through Ukraine. On Jan. 7, one week after the initial cut-off, the pipelines to Europe stopped flowing. Russian TV channels stated that Ukraine had blocked the transit of the gas, with reports implying that Ukrainian officials had admitted to shutting down the pipeline. However, other sources claimed that Russia had been the one to shut off gas supplies, in retaliation for Ukraine's alleged gas stealing. On Jan. 11, Russia and Ukraine signed an agreement to allow international teams to monitor the pipelines. However, two days later, when Russia attempted to restart transmissions of gas, it found the pipeline still non-functioning. This led to yet another public dispute, with both sides blaming each other in the media. Russia claimed Ukraine had not opened the export valves and was not admitting Russian observers to the gas transmission stations, while Ukraine stated that Russia's transmission attempt had been without any preliminary agreement. Finally, on Jan. 20, Russia's gas supply to Europe was restored after an agreement was reached by Russian Prime Minister Vladimir Putin and Ukranian Prime Minister Yulia Tymoshenko. The new agreement stated that Ukraine would not raise the fee for Russian gas transit, and Ukraine would receive a 20 percent discount on the basic price for gas. Each side has claimed victory in the dispute. 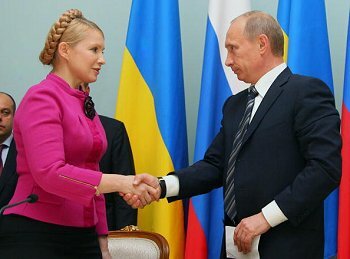 Putin said he and Tymoshenko had also agreed that in 2010 the two nations would "switch entirely to European standards of pricing and pumping tariffs without any exemptions and discounts either for transit or for the gas price," which would mean the end of cheaper gas for Ukraine. In turn, Tymoshenko said the 20 percent discount granted to Ukraine would give the country a year of opportunity to work on diversifying its energy sources. Tymoshenko also reportedly expressed hope that after 2009 Russia would still allow the Ukraine to purchase gas at a cheaper rate than the E.U. countries. According to reports, Russia's Gazprom lost more than $1.1 billion in revenue for the unsupplied gas. The affected E.U. countries could also require Gazprom to pay penalties of up to $4 million for each day the gas was cut off. However, Russia is already trying to pressure Ukraine for financial reimbursement. President Medvedev recently made a statement calling Ukraine responsible for all financial losses during the dispute. It has also been claimed Ukraine incurred major losses because its steel and chemical plants, the backbone of the nation's economy, were temporarily shut down due to the lack of gas. In addition, the country reportedly lost $100 million in transit fees because of the cut-off. Russia is currently experiencing a recession in most sectors of the economy, and Ukraine, which has fewer natural resources, had a 20 percent decline in national production in late 2008. The damages incurred on each side during the latest gas dispute are undoubtedly major blows to both wounded economies.